This two-bedroom loft-style apartment is bright, spacious and super contemporary. Its large, fully-equipped kitchen, marble island and four-person dining table make it perfect for entertaining, though in the summer you’re more likely to want to dine on the huge teak-furnished patio. The guest bedroom features a queen-sized bed and the master bedroom a king-sized one, both with memory foam mattresses. The master bedroom is also equipped with extra luxuries like a smart TV and a walk-in closet. The stylish living room has lots of comfy seating space and a 50” smart TV, while the spacious bathroom features a separate bath and shower. A skylight window fills the chic space with natural light. In short, you couldn’t ask for much more. (The access to the private terraces will be possible starting on 1st of June 2018). The Centre Lofts is an urban building designed by Simplissimmo. 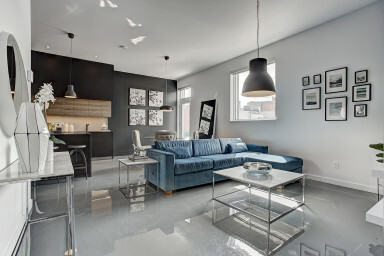 Its loft apartments all feature sophisticated black-and-white décor, an open concept layout, high ceilings, ample storage space and quality materials, including luxurious black marble countertops. The perfect space to work, live and gather with friends, each one- or two-bedroom unit comes fully equipped with everything you need to make yourself at home, including linens, a Dyson vacuum, unlimited Wi-Fi, wall-mounted air conditioning, a washer and dryer in the outfitted closet and a smart TV. The Self-Check-In process developed by Simplissimmo makes arrival easy, and outdoor parking is available to rent. Pointe-Saint-Charles is a residential neighbourhood in the burgeoning Sud-Ouest borough of Montréal. This traditionally working-class area with a strong industrial heritage has seen a flurry of trendy bars and restaurants pop up in recent years, but one of its best assets is nearly 200 years old: the Lachine Canal, which offers 13.5 kilometers of navigable waterway, green space and cycling paths. A short footpath across the canal leads to Atwater Market, an essential destination for all foodies. Plus, with Charlevoix subway station just one block from the Centre Lofts, downtown Montréal is only minutes from your door. Great space in quiet location. We enjoyed the clean lines, space, outdoor patio and general relaxing atmosphere of this great flat. It was easy to find and close to a subway station. Enjoyable! Our stay was lovely. Everything was convenient and easy to access. The only 2 things were 1 The smell of the garbage cans when you enter the building. Would need to empty them maybe more Often. 2- The bath towels. One of them was quite rough. Seemed to have been air dried and not in a dryer. Beside that, everything was lovely. It wasn’t as clean as it should be, and I think it wasn’t fair to ask me to clean it up, even if I did. But I think if you ask for it it has to be shining clean. But after all it was a great experience, very well located. The place is great! There's a lot of space. I think this is the biggest apartment which i visited so far. Great decorations, comfortable beds and nice bathroom. Very warm! I would totally recommend this place to stay.